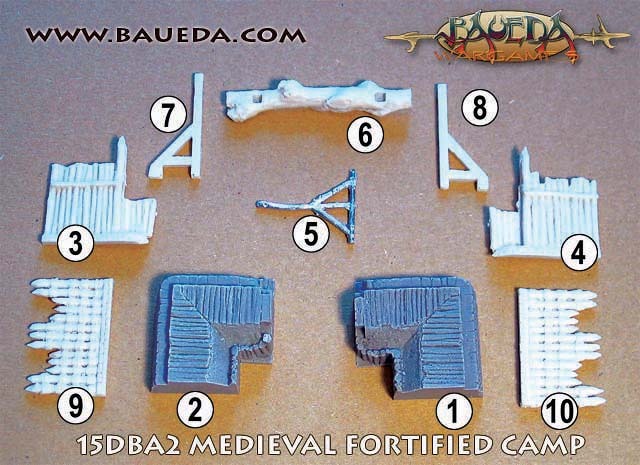 15mm DBA Medieval Fortified Camp AVAILABLE NOW! 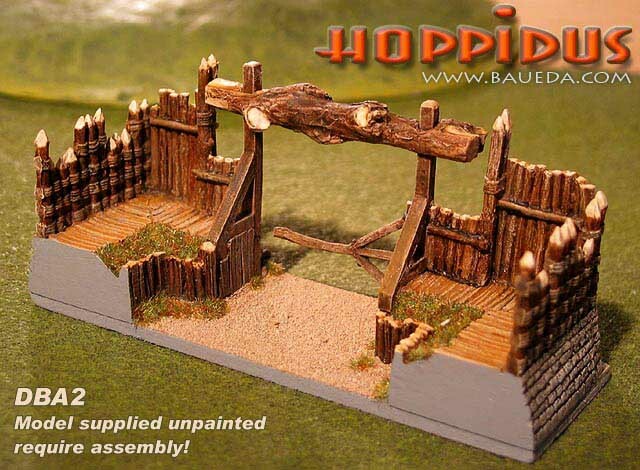 This is a medieval european camp set based on the "HOPPIDUS" modular system for ancient fortifications and designed specifically for DBA. 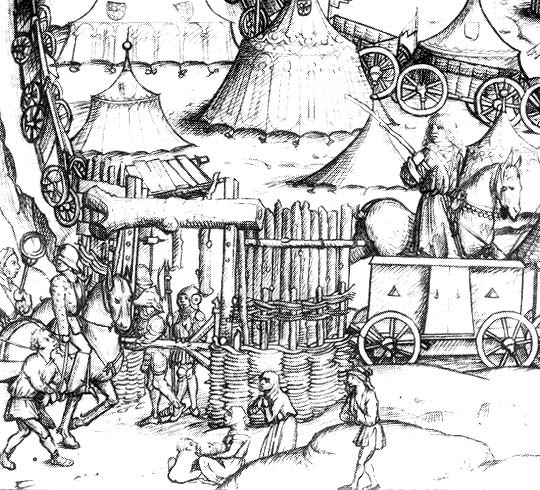 This set contains a selection of modules that let you create a model of a fortified perimeter gate, such as those depicted in the Mittelalterliches Hausbuch. The complete set consist of a base formed by two truncated corners embankment elements, (left and right handed, each with a timber stockades on both sides) which leave a full module frontage (40mm) gap, and a wooden bar of the same frontage to close the gap itself. This forms the base for a separate wooden superstructure to defend the gate, made with a solid tree trunk. The gate bar is cast in metal. All the products in the fortifications range are supplied unpainted in kit and require assembly. This set include all the modules required to make a legal size 120x40mm DBA camp large enough to hold an element of camp followers in the courtyard. It includes 10 parts, assembly instructions and painting example. Please note that the kit does not include or need a base like that shown in the picture. We do suggest to use one as it add strength to the model, but is up to you really! HOPPIDUS is a truly modular system, and all elements of this set are compatible with the rest of the range. 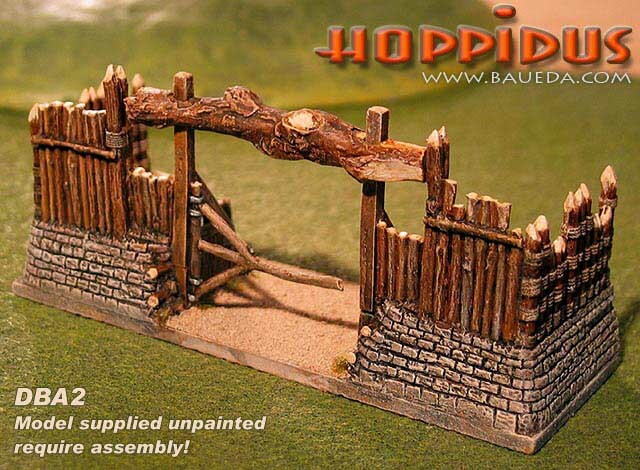 This means you can also add more elements from the complete HOPPIDUS range to expand and customize this set, for example adding the other three sides on a separate base, to make a completely enclosed fortified perimeter to be used for a scenario game... Just remember you can pick and choose any combination of modules you like, and we're here to help you at any time, so just e-mail us for any special requirements! Finished camps painted and ready to play: available on commission order; contact us for details!